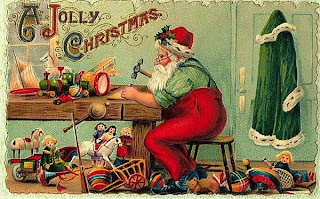 Megan's Tiny Treasures: Christmas - so little time, so many things to eat. Christmas - so little time, so many things to eat. In the southern hemisphere Christmas arrives in the middle of summer. There is an abundance of fruit and fresh vegetables to choose from, and during the very hot days a cool fruit snack is much more suitable than fruit cake. Here are some quick ideas I'm going to try. 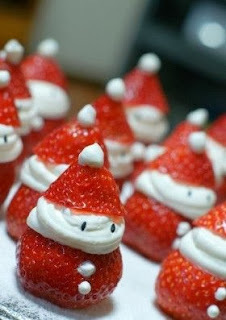 Marshmallow, strawberry, banana, grape Santa. 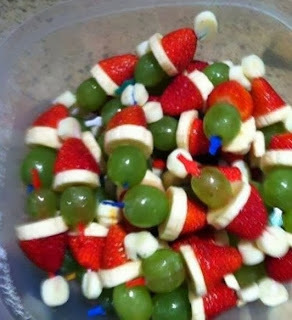 What fantastic ideas, I love those Santa's.